I’m just sharing a really simple card today that I made last night for my teenage collection. But I think it could really be for anyone. It is how I like my summer to be. onto shiny cardstock and simply stamped on. The seagulls have been bleached so that they stand out more. It is almost a one layer card…the chit chat stickers are the only extra on this card. And the stamps are from Katzelcraft and Chocolate Baroque. Hi Dot, this is a gorgeous card – you've really captured the clear blue of a summer sky and the birds give that sense of freedom too. Well, I think the colour looks beautiful and they are blended so beautifully. The bleached stamps are really effective too. Great card! You have captured calm and peaceful perfectly Dot and the bleaching really makes the gulls pop. Beautiful Dot, you definitely hit the calm spot with this one. Gorgeous images and a fabulous composition. I feel very relaxed just looking at it! Love the colour and the bleaching on the seagulls is very effective. LOVE your card, and you're right, it can be for anyone! Gorgeous card Dot. 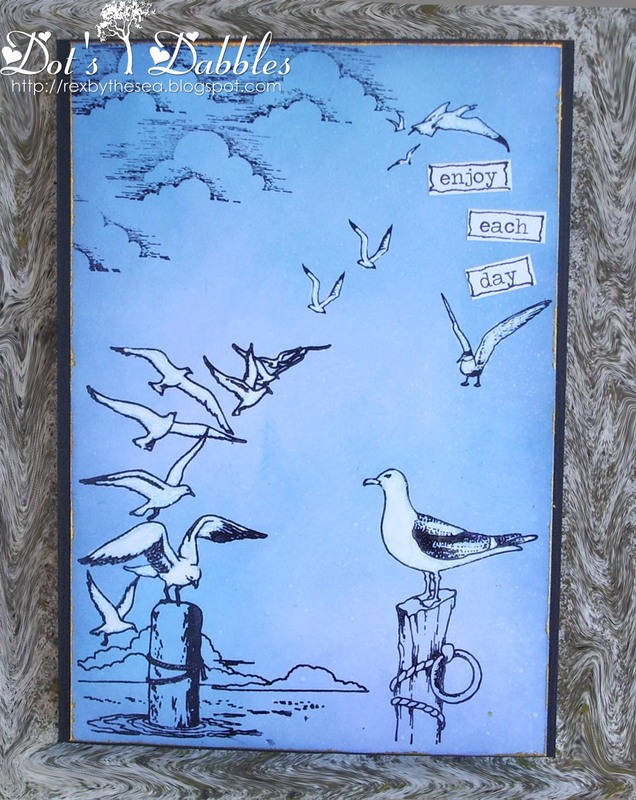 Beautiful inky colours and love those stamped images, bleached birds. Very beautiful and great card Dot. Fabulous sea scene , the colours are great look. Thanks for joining us this week at SFC. Hi Dot – you have created a really great scene on your card. I love the images and the colour you have chosen. Thank you so much for joining us at Lady Anne's challenges this time. I do hope you join us again soon.